Japanese Foreign Minister Taro Kono on Sunday met with President Rodrigo Duterte to extend Japan’s willingness to improve the infrastructure in Mindanao. 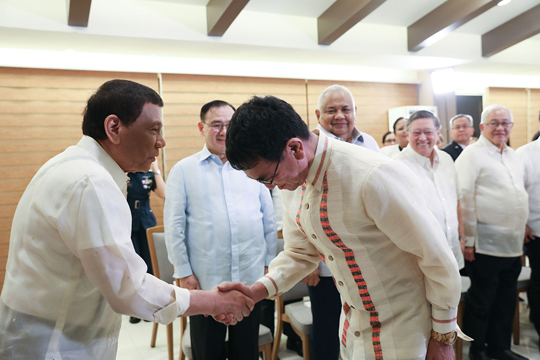 Malacañang said Kono, who is here for a three-day official visit, paid a courtesy call on Duterte at the Matina Enclaves Residences in Davao City. “Foreign Minister Kono said Japan welcomes the ratification of the Bangsamoro Organic Law. He also mentioned that Japan would like to continue to support the development of Mindanao,” the Palace said in a statement. With the BOL, the government hopes to address the people’s aspiration for genuine autonomy and end the decades-old conflict in the region through the establishment of a more powerful and self-governing Bangsamoro Autonomous Region in Muslim Mindanao. Kono also said Japan will support capacity-building during the transition period of the BOL, vowing to give job and livelihood creation for former Moro Islamic Liberation Front combatants. Kono, along with Japanese Ambassador to the Philippines Koji Haneda and Davao Consul General Yoshiaki Miwa, has expressed Japan’s sympathy to the victims of the two fatal blasts that rocked Jolo last month. His official visit is the first for Japan’s top minister. Kono’s visit also come months after Chinese Foreign Minister and State Councilor Wang Yi paid Duterte a visit in October last year. He said Japan had been helping Duterte achieve his transformative agenda for the Philippines in terms of infrastructure, social inclusion and securing peace and progress in the southernmost part of the country. “We emerge from this morning’s meeting freshly confident about prospects for realizing Mindanao’s promise in the wake of positive, indeed striking developments, in bringing Bangsamoro to reality. The inauguration of the Japanese Consulate-General later this evening demonstrates Japan’s enduring commitment to Mindanao, especially with the ratification of the BOL,” Locsin said.